Our annual fundraiser, the Winter Mixer & Wreath Auction, held this year at Peg and Ter's. Please join the Board of Directors, our friends and staff for an enchanting holiday-flavored evening w/ live wreath auction, cocktails, hors doeuvres and FUN! Your $35 ticket includes a complementary CRAFT cocktail, glass of wine or beer, light fare by Peg & Ter's and a handcrafted holiday ornament. This is a popular holiday event, which has grown each year! We are so thankful are to have the continued support of our area artists and local businesses. Expect more artisan wreaths, an exciting live auction, music, and fun! Funds raised will benefit the Shelburne Craft School Educational Programs. Each year the Craft School contracts with area schools to offer woodshop, glass, metals, visual art and clay programs, as well as summer camps and afterschool classes for all ages. 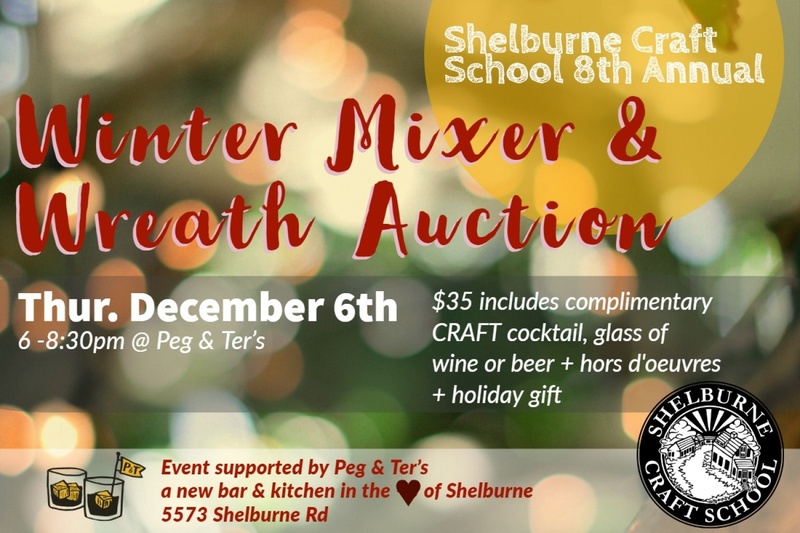 Please show your support of the Shelburne Craft School by sponsoring the 8th Annual Shelburne Craft School Winter Mixer & Wreath Auction. Shelburne Craft School is a nonprofit 501(c)(3) organization. The Shelburne Craft School's mission is to inspire individual creativity by providing hands-on education in craft and art. Where craft is made, since 1945. Thank you for your generosity! We understand that there is a strong demand for charitable donations. We are extraordinarily appreciative for your support of the Shelburne Craft School!